Within the context of the September 11 2001 commemorations, the MoMA PS1 presented, until 9 January 2012, an exhibition entitled September 11. Its intention was not to show works created since September 11 and referring to this event which created a whole new world. Instead the show was intended to present works realised before the collapse of the Twin Towers which, though created in a different context, cannot help but make you reflect on this tragedy. In order to add to this intention with an even older work than those presented at the MoMA PS1, I was drawn by the idea of introducing one of today's two popular prints from the striking photography by Sherill V. Schell (1877 - 1964), taken in the early 1930s and entitled News Building under construction. This traditional print is of outstanding quality and you couldn't fail to admire the flecked, fleecy beauty of the clouds in particular. It measures 30.5 x 23cm and is mounted on a board signed by the artist. Sherril V. Schell was one of the major photographers from the American modernist avant-garde. Born in Iowa in 1877, to a father from New York and a mother originating in Wisconsin, it was in London that he gained renown for his pictorial portraits until the First World War. Indeed the National Portrait Gallery keeps several of his prints from this time, including a famous series depicting the poet Rupert Brooke in 1913. However, after settling in New York, midway through the twenties, Sherril V. Schell became passionate about the skyscrapers in this modern metropolis, which was constantly under construction. He was certainly influenced in that by his brother-in-law, the painter and designer Chesley Bonestell (1888 - 1986)(1), who was tasked by the architect William van Alen with the outside decoration of the Chrysler Building, where he notably went on to create the celebrated eagle-shaped gargoyles. However, Sherril V. Schell, who passed away in 1964, sadly didn't have the opportunity, like Berenice Abbot, to live long enough to defend his work. His friend and most fervent admirer Edward Steichen, who had been the manager of the photographic department of MoMA since 1947 and who was certainly, along with Julien Levy, art critic Henry McBride and Lincoln Kirstein, the founder of the Harvard Society for Contemporary Art, battled so that the views of New York he still owned, were part of the museum's collections. Later on, these fifteen images were assigned by the MoMA to the collections at the Museum of the City of New York, which showed them from 12 April to 13 June 2006 in an exhibition entitled Sherril Schell: unknown modernist. This was certainly the first stage of a needed rediscovery of this pioneer of Modernism, who became one of the masters of American photography and whom I shall not fail to make reference to and show more of his works on this website very soon. 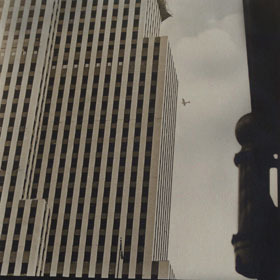 Beyond the exceptional quality of the printing, the originality of the composition and the graphics of the shadows in the foreground, what is striking about this image of the Daily News Building, is obviously the presence of the plane flying over New York, which makes you feel as if it's about to hit the skyscraper. Added to this impression is the strange sensation created by the building itself which, due it awaiting completion, may lead you to think that it is in part destroyed. As such it is reminiscent of the constantly played images of the façade of the North tower of the World Trade Centre gaping open, whilst a second plane is preparing to crash into the South tower. Finally, in the bottom right-hand corner, we note the presence of an American flag which is out of proportion in relation to the bulk of the building and the enormity of the drama which appears to be playing out before our eyes.